AayurMed cultivates, sources, supplies and export Herbs for last 30 years across the globe. Our herbs are used for various medical and cosmatics purpose. Celastrus paniculatus is a treasured medicinal herb that is revered for its effects on the brain and has been used for centuries in Ayurvedic Medicine for sharpening the memory, increasing intellect, and improving concentration. Other Name: Gahula, Celastrus paniculatus, Mal kangani, Jyotishmati, Malkangni Bee, black oil plant, climbing staff tree. 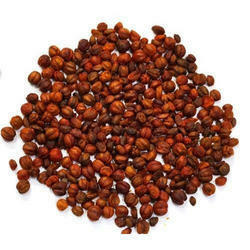 We are engaged in offering Celastrus Paniculatus Fruits to our clients. These are used in preparing cold-pressed raw herbal oil. The oil is used to increase memory and facilitate learning. These fruits also induce a feeling of well-being and have reported effects. Having no side effects, these are safe to use as medicine. Kapil Enterprises is into exportation of herbs , including according to Unani system of medicine, it is used as a brain and liver tonic, cure joint-pains, paralysis and weakness. Appetizer, laxative, emetic, powerful brain tonic, cause burning sensation. Enriches blood and cures abdominal complains, cure joint-pains, paralysis and weakness. Celastrus Paniculatus has been described by users online as a “brain tonic. It produces a light, refreshing burst of mental energy within a short while of consumption. It creates the feeling of fluid, alert thoughts, and heightened concentration. It can be taken as a potent and effective stimulant which makes schoolwork or other detail oriented tasks easier to focus upon and complete. Celastrus paniculatus is a woody fruit-bearing vine. The fruit of the plant contains seeds used inAyurveda medicine. We are a unique name in the industry to provide our prestigious clients an exclusive range of Malkangani Herb. Celastrus paniculatus is a woody liana commonly known as black oil plant, climbing staff tree, and intellect tree. This climbing shrub grows throughout India at elevations up to 1, 800 m.
Specifications: We are Manufacturer & Exporter of Celastrus Paniculata Seed Extract.